Urban Spoon (Miami, Florida), Likes it - Greenstreet Café has to be one of the most incredible places to wine, dine, and enjoy many memorable moments amongst friends, family and a loved one. Their ambience is relaxed but incredible soundtrack that transports you to Morocco, Ibiza, Germany and France at any given moment. The furnishings and decorations bring an air of mystery and distinction which makes Green Street Café stand far above the rest and their Mediterranean menu will delight even the pickiest of palates. 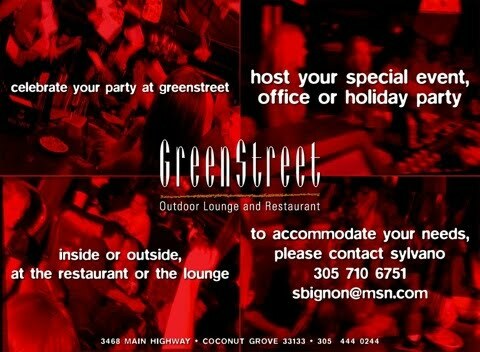 With flair of extravaganza and a dash of VIP seating, Greenstreet Café is simply the place to be. Situated in the heart of Coconut Grove, there is never a dull moment as Greenstreets pleasant and friendly staff make sure you receive the most impeccable of services and the best meal in town. GreenStreet Outdoor Lounge and Restaurant, Coconut Grove's premier "seen and be seen" restaurant, was founded 19 years ago, by husband and wife team, Sylvano and Maida Bignon. Throughout the years, their European background has influenced them to create the GreenStreet "Philosophy", making their place evolve into a "Lifestyle". It is a rare day not to encounter local politicians, artists, athletes, or simply thousands of locals enjoying breakfast, lunch or dinner, just sitting for a glass of wine, taking a break from their dog walk, having a business meeting, a baby shower... or simply relaxing on a sofa, for a late night amongst friends. Some might invent reasons to come here... just to be there, several times a day... Breakfast is a must, especially on Sundays, as lines may form, while patrons sip on a glass of champagne, laughing and socializing while waiting for their table. 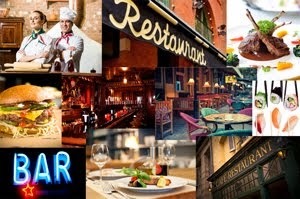 For a complete online menu click here.